Barely a month after the excellent UKOUG event in Liverpool, Oracle OpenWorld Europe is now just around the corner. Both physically and metaphorically for me, actually, since I can get to the Excel almost as quickly as I can get to my office – sometimes we luck in with locations I guess. But before I don my grey Fedora (if we haven’t met before I’ll be easy to spot…) and remind myself to change (rather than depart) at London Bridge, here’s my guide to the packed two-day agenda. As ever there are some regrettable clashes and overlaps, but I’m still always happy to sync up with anyone interested in the same sessions as me and to swap notes after. 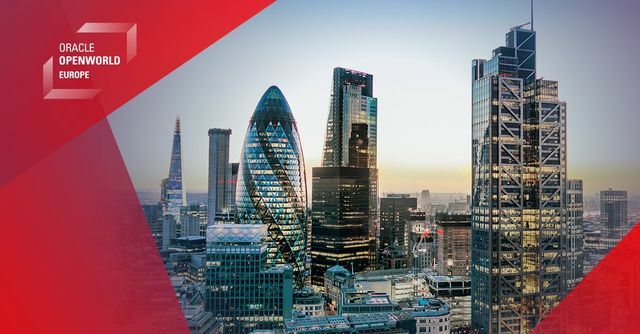 I’ll begin on Wednesday with ‘Lessons from Deploying Digital Assistants and Chatbots’ by Oracle’s Ian Wallis at 9am, although I’ll be sad to miss Innovating The Public Sector – Lessons from the UK and Globally by Oracle’s Head of Public Sector – CX Applications Rob Grace. At 9.45 I’ll be heading to Next-Gen Cloud Technologies – Real World Case Studies hosted by Jason Sahota (Charles Taylor InsureTech Ltd), Charlotte Riggio (Oracle), Gareth Williams (YellowDog), Simon Bain (Shieldio), and Philippe De Raedemacker (EGGO Kitchen & House), before heading to the Morning Keynote ‘Cloud Generation 2 – Autonomous, Secure and Extensible’ with Andrew Sutherland (Oracle), Kyle York (Oracle), Yves Bernaert (Accenture) and Rondy Ng (Oracle). I’m then faced with my first major set of clashes, with six talks at 12.10 and four talks at 12.55 catching my eye. I’m listing them below so let me know of any clashes you’re also facing and we can arrange to cover some extra ground and swap notes away. I also realise that I’ll need a large breakfast since even going to just one talk at a time will necessitate an attitude of ‘lunch is for wimps’! Any-who, at 13.40 I’ll be off to Your Cloud Transformation Roadmap on Oracle Cloud Infrastructure (Peter Woehr, Allianz and Kyle York, Oracle). After a short break, at 15.10 I’m going to Dain Hansen’s (Oracle) A Practical Guide to AI, Machine Learning, and Data Science, and then round off the day with the afternoon keynote How Current Events are Impacting Your Business (Lord Mark Malloch-Brown). Thursday starts with the talk which I will openly say I am most looking forward to Myth: FCC Cannot Replace HFM – I’ll be attending Mark O’Sullilvan’s (Grant Thornton UK LLP) talk at 9am but it’s also repeated at 12.55 and I’m sure we’ll all be interested to hear Mark’s points on what has sometimes been a contentious issue! I’m then faced with three overlapping talks so let me know if you’d like to share note-taking duty! The Morning Anchor Keynotes at 10.30 boasts an excellent line-up, including Leo Johnson (PWC), Amanda St L Jobbins (Oracle), Mark Hurd (Oracle), Dr Becky Sage (Interactive Scientific), Javier Garcia del Rio (Mutua Madrid Open), and Dan Cooper (Movember). From here, I’ll be heading to Re-imagine Your Financial Close in the Cloud (Rich Wilkie, Oracle, and Richard Cahill, Paragon Group) before my next clash at 13.15 between Monetizing Smart City Digital Services (Richard Hallett, Oracle, and Jean Lawrence, Oracle) and The Big and Small ‘T’ in Digital Transformation (Abdul Hamid Ebrahim Jassat). At 14.25 I’ll be heading to Enhancing Your Insight with Oracle Analytics (John Hagerty, Oracle, and Robert Dutcher, Oracle) before heading at 15.10 to Getting on Track with Oracle Analytics Cloud (Anthony Brown, Network Rail; Ifran Yousaf, PWC; Gareth Diamond, PWC; Alexander Sommer, PWC) and rounding things off with Eddie Izzard’s afternoon keynote which I see is being kept under wraps for now with just a biography on the official agenda.
" I don't have techno-fear, I have techno-joy. I love technology! I love to get a new machine. Every time I get a new machine, I think, 'This is the one! I won't have to work again; I've got this thing!' And, if you have techno-joy, you get the instructions, you unwrap it, and you throw the instructions out the window! [mimes doing so] Forget them! **** 'em! [mimes turning on a computer] On. [mimes typing] I must know how this works... I've used machines before!’"
I do hope Eddie likes hats. I won't sit front row... just in case. Bring the future into focus at Oracle OpenWorld. Gain enterprise expertise and start-up ingenuity directly from experts across retail, manufacturing, financial services, technology, the public sector, and more. Join innovators as they challenge assumptions, design for better outcomes, and leverage transformational technologies to create future possibilities now.